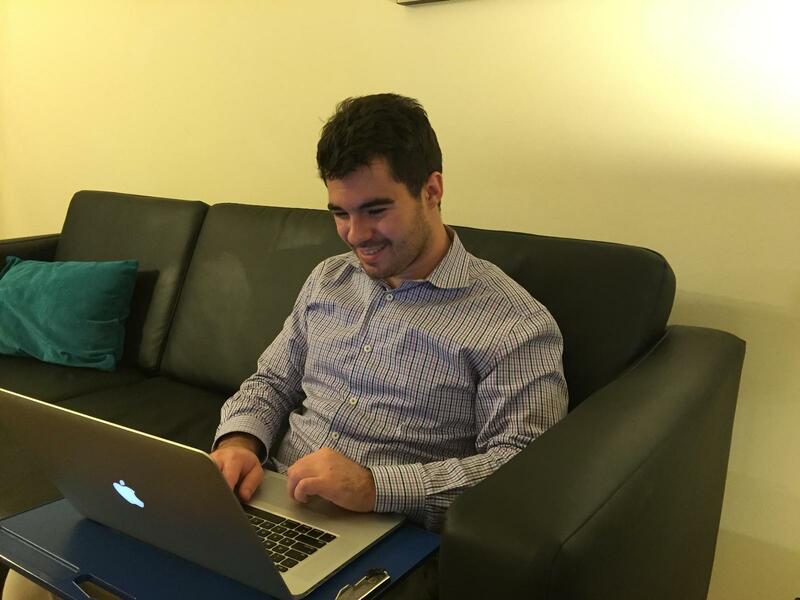 With graduation quickly approaching, Jonathan Fudem ‘16 reflected on his experiences as a MAP student, his time spent working at Trojan Vision and his role as a research assistant for Professor Kuhn’s innovative media project. Fudem confidently looks forward to the future having acquired the skills necessary not only to adapt, but also to thrive in an ever-evolving creative industry. How did you choose Media Arts + Practices as your major? 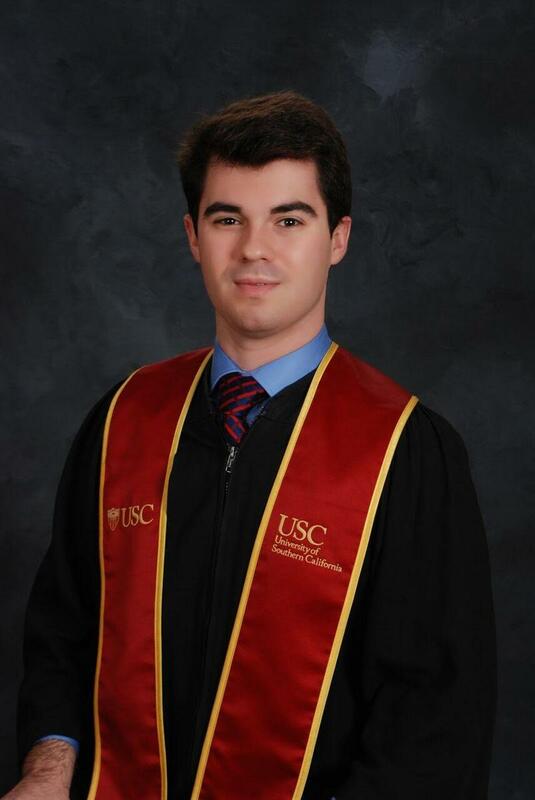 I was undecided for my first two years at USC. In May of my sophomore year, at the very last possible moment, I declared MAP as my major. The major actually didn’t exist when I was a freshman, so to a certain extent I was waiting for this amazing program to be created. I also wanted to wait until I was ready to commit to something. Having always been interested in design and code, specifically combining different types of media, I wanted to learn how to combine creative disciplines with different types of technologies. MAP emphasizes figuring out what you want your personal expression to be and then working with the latest and greatest technology to do that. The whole program really focuses on allowing students to express their own personal voices. There’s a lot of flexibility in the program for students to craft their curriculum around what their own interests are. I really respect that and I love how cutting-edge it is to think of cinema as something broader than just movies. I’ve enjoyed learning how to use cinematic storytelling techniques to create a website, or a game, or something that doesn’t even exist yet. MAP in itself is quite interdisciplinary. How has your experience been being a MAP student and learning many different creative and technical skills? Most of the projects we do are centered on talking about media strategies and techniques that allow us to create media with a sense of ethical purpose. There’s an emphasis in the division on what’s emerging, what’s next. We’re given the place to think about how we can tell stories by applying story techniques that have been around for millennia to new creative platforms and devices. We really focus on how to use form and content together in harmony. “Interdisciplinary,” “multi-platform,” “emergent” are all words that we talk about a lot in MAP. We’re taught to create a great experience that is entertaining but also helps people think about the world in a critical context. MAP doesn’t limit you to any one field. We’re being prepared for careers that don’t even exist yet. Everything we learn can be applied to a whole range of careers whether it’s marketing or design-based or something that resembles traditional cinema or something that’s new and more experimental. How do you think your experiences with Trojan Vision have supplemented your studies as a MAP student? It helped me get an appreciation for the craft of cinema and TV-making. Trojan Vision is centered on the idea of “just go for it and figure it out as you go.” I absolutely loved my time there, and the people I got to work with. I loved being involved in helping people tell creative stories and bring really ambitious concepts to life. Having that hands-on experience and getting to work alongside creative people was wonderful. Sometimes, in MAP you work on projects that tend to be individual-focused but you’re always collaborating and sharing ideas with other people. And Trojan Vision does that really well. It’s such a team effort. I learned how to collaborate and help manage a creative place where people work together to create really cool content. I’ve taken so much out of it, and all the lessons, experiences and friendships that I made there are really going to last a lifetime. What is one lesson that has stuck with you? At Trojan Vision I got to take creative risks, learning that no matter what happens there are always going to be problems. Something is always going to go wrong. And, ultimately you’re going to have to deal with those mistakes. So, since that’s always going to be the case, I learned to make sure that the mistakes I make happen when I take a creative risk. I’m not afraid of risky projects that are complicated. I think it’s something to keep in mind in everything that I do and MAP really encompasses that. If you want to be creative, if you want to push boundaries, you’re going to make mistakes, but let them be worthwhile mistakes. It’s better to make mistakes while working on something you really care about than something that doesn’t excite you. How have your studies influenced your long-term career aspirations? I’ve always wanted to create something that hasn’t been done before. And, MAP hasn’t jaded me from that dream. I know that I’ll be taking the technical and creative skills I’ve acquired and applying them to some sort of creative agency or media company. I’d love to go into something like creative strategy or product management. Which would combine everything that I’ve done at USC, since in MAP I’ve learned how to work with both the creative and technical sides of media. I like to call myself a digital magician. It’s a bit silly but it’s somehow really true. My goal is to create content where the hardware and software disappear and all you have are amazing experiences that captivate people. As a MAP student, I’ve learned to apply my skills to whatever I create. In five or ten years, the technology will change. There’s always going to be something new. MAP teaches you how to dance from one platform to another. We’re taught universal strategies of how to combine code and creativity. What’s great today may not be what’s great tomorrow. It’s the people, the ideas, and the hard work that are the constants in a world where the ways we communicate are changing on a daily basis. You’re also a research assistant to Dr. Virginia Kuhn. How did you first get connected with her? What are you researching? Dr. Kuhn is a MAP professor and she was one of the readers of my application when I transferred into SCA. Last year, she asked me and a couple other students to help her out on this video analytics project that she’s been working on. It’s amazing. She and her team of super computer scientists are able to analyze video in three dimensions. They’re not talking about frames, but they’re talking about volumes and stacks of video timelines in three dimensions. It’s all really experimental and innovative. I helped test the system and also was involved in helping her do branding and designing the logo. I designed the website (www.thevatproject.org). The biggest challenge has been trying to package and brand the project in a way that people could understand what it’s all about. There are about a dozen different algorithms that run through the program. That’s really complicated. How can you communicate that simply and visually? Ultimately, we ended up creating a moving logo, which isn’t necessarily revolutionary but gives you the impression of what all those technical processes do. It was a lot of fun figuring out how to take something that doesn’t even exist yet and packaging it in a way that communicates to people its cutting-edge technology and what it’s going to be able to do. It’s been inspiring to see her and her team working so hard to taking steps toward making something accessible tomorrow that doesn't even exist today. Could you share what you’ve been working on for your thesis project? I’m looking at online privacy and digital surveillance. I’m usually really optimistic about how we can use media but I’ve decided to go against my own grain and focus on an area where we see media and technology being horribly abused. We live in a world where technology is used to steal people’s private information and to dehumanize people. I’m interested in inverting the conversation and getting people to interact with issues of privacy in a different way. Privacy and online surveillance are topics that we’re all familiar with but they’re kind of boring. We know that we should be concerned but no one really wants to hear all the technical jargon that comes with the alphabet soup of online privacy. My thesis project, which is comprised of two games, focuses on making people aware of how their personal information is being grabbed up by government agencies and companies. The games I’ve created place the average user on the side of collecting and monitoring other people’s data. The first game, which is called LOVEINT: A Game of Love and Intel, is a web-based computer game. It puts the player in the role of a jealous NSA analyst and you can abuse your security clearance to spy on your loved one’s private conversations and figure out if they’re cheating on you. The terrifying thing is that it’s all based on true stories. There have been specific cases when NSA analysts have abused their access to spy on people for their own personal interest. If you research this data, you will find that congress and the NSA have admitted to this abuse of “power”. And those are only 12 times that have been confirmed. It’s terrifying. Hopefully this game helps the player to think about privacy differently as you are requesting metadata and spying on people. It’s the idea that when you start looking at people as data, you realize that we don’t really own our information, which is a terrifying truth. The second game is a board game called Private Affairs. This game looks more at corporate surveillance and how companies are able to track what you do on the web and use that data against you. In the game, you move chips around and play as a data company with the goal of driving traffic to your ads on the network. The catch is that as you play, you actually have to wager and protect your own information. For example, if you find yourself in a position where another player has gotten the advantage over you, in order to keep playing you have to give the other player your cellphone and that person reads out loud your text messages. You don’t have to do that since you can choose to forfeit. But the idea is that the players are uncomfortable with looking at someone else’s personal information and giving up their own information. This all points to how we trust shady people in big companies who are doing this all the time. Hopefully, these games help people consider the implications of these databases and polices that allow companies and the government to track everything that we do.